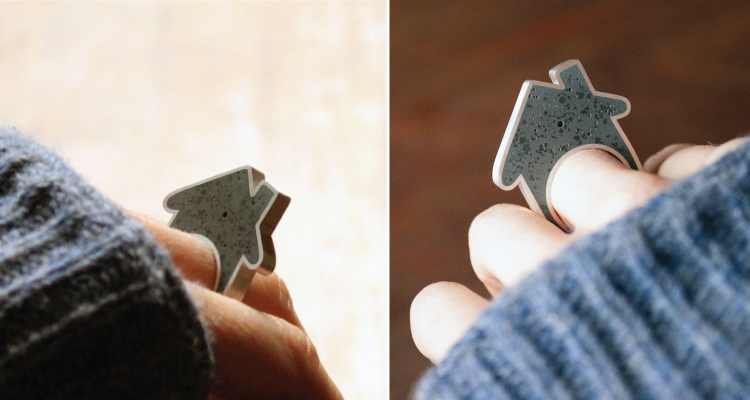 What a wonderful journey, this project has now evolved into an awesome DIY Concrete House Ring; a silver and concrete composite unisex ring that invites you to experience the unique and rewarding process of making. 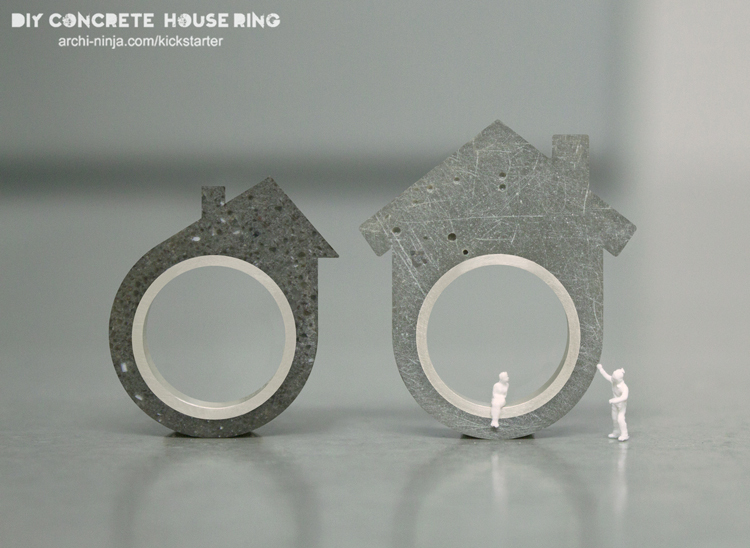 The DIY Concrete House Ring has officially been launched for the world to see via KICKSTARTER, and where I have 30 days to seek funding for the project to hit production. Head over to Kickstarter for some awesome images, videos and everything you need to know about the project. I cannot do this without your support. Please join me on this incredible journey by backing my project and sharing this with your family, friends, colleagues and everyone you know that enjoys the beautiful adventure of awesome ideas! 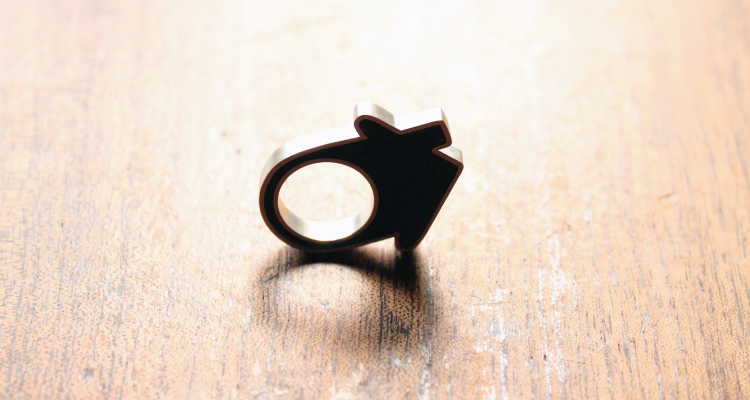 Concrete House Ring is an elegant, audacious piece of jewelry designed by Linda Bennett, founder and author of archi-ninja.com. 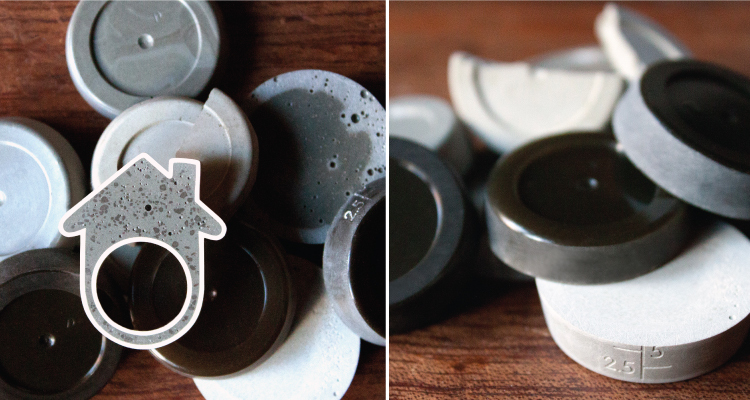 A hand casted concrete and resin composite is moulded within a sterling silver, satin finish inner and outer piece. The icon of the house enunciates to the memory of home, where families grow and contract, habitual routines are developed, and our notions of safety and placemaking are formed. It is possible to associate deep and unique metaphorical connotations to the Concrete House Ring, yet it is also the evolution of its own design process, the shifting of scales, intimacy, and a personal narrative that Ms. Bennett shares freely with her audience. The design and construction of the ring reveals in part archi-ninja.com’s ongoing discussion about the architect’s experience, the challenges and the victories bound to the profession. The following is a conversation between friends, Arianne Gelardin and Linda Bennett. AG: Can you talk about the notion of ownership with the Concrete House Ring and how that may differ in regards to architecture? LB: Ownership was an important theme when designing the Concrete House Ring; it allowed me to consider ownership not as a commodity but through personal ownership, a sense of gratification and pride. My experience in the industry to date has been as a contributor to a much larger design process. The ring allowed me to be an author as the decision maker rather than working under someone else’s decision and sequential direction. The process of ownership during the design and making was about liberating my role in creative design. AG: What associations do you have when you, specifically, wear the ring? LB: The ring serves as a reminder of my recent relocation from Sydney to Melbourne. Melbourne has provided an exciting professional opportunities that allowed for greater creative expression. Having found happiness and energy in this transition, I can’t help but think about creative projects with every moment. The house represents a pursuit of change, safety through place, and knowing that no matter where I live, I am reminded of home: the home in Sydney that I grew up in (the nostalgic past) and my new home in Melbourne (the future and new opportunities). AG: Once when discussing architecture, you used the term, “fear of inadequacy.” Can you talk about this in relation to the ring? LB: Concrete House Ring is about transforming my role as a recent architecture graduate, which was burdened with a fear of inadequacy, into a productive exploration of creativity. The process of making the ring allowed me to experience a unique set of challenges distinct from my everyday role as an architect. Unlike my day-to-day work, the ring project had no implications of practicality, legislation, time, budget or brief. It was a project, quite simply, for the enjoyment of translating concept into object. It was about dealing with only two materials–concrete and silver–instead of hundreds. The form is reduced to a symbol rather than massive building components. It’s meaning is derived from idea rather than demanded by function or constraint. By scaling everything down it takes away the fear of the massiveness of my responsibilities in architecture. AG: There is perhaps something less daunting about the scale of the ring than, say, the design of a building. It involves a more approachable design process that is immediate and charged with less risk than architecture. But the ring’s form is deceivingly simple. While the form has only a handful of curves and a basic structure, it is more intimately connected to the scale of the body and therefore highly sensitive to the subtlest of variations. LB: Through its scale and simplicity, the ring takes on a new meaning, beyond the initial symbolism of home. It’s meaning is connected directly not only to the body but to the hand, a part of the body that constantly exchanges and engages with our surroundings. I love the idea that by reducing something in scale, we can heighten our experience and understanding of it. We can perceive intrinsic details that we often miss when we are surrounded by all the massive distractions of space and environment. Simplicity allows something to come into our focus, noticing the imperfections of the concrete, the changes of its colouring under different conditions, the way it moves on the finger, its texture, weight, and how it begins to take on its own narrative through patterns of everyday wear. AG: Historically, many architects, especially the modernists, took pause from their large-scale work to design furniture, for example, or to paint. In 2012, the Museum Für Angewandte Kunst Köln (Museum for Applied Art) presented an exhibition, From Aalto to Zumthor: Furniture by Architects, after which one critic suggested that while a slow market may have played a role in the decision to periodically switch scales from architecture to furniture and industrial design, more importantly, there was the “desire to control a whole project and to ensure a formal unity throughout. Inside and out.” Do you see potential for other types of “side projects” for today’s emerging architects? LB: Yes, I think architects have a wonderful ability to be qualitative and quantitative which historically flows into other professions. I don’t think it is derived from control but from seeking to understand. Architects are constantly critical and questioning. Side projects offer another forum to communicate ideas, to reach a different audience, and to create different scales for human interaction. I think expanding into other industries is a perfectively valid way to test new materials, technologies and concepts at a scale that is more accessible and comprehensible, not only to architects but also to the end user. Often this is a way to test personal or professional ideas, which feed back into architecture and hopefully create a richer understanding of our role in society. AG: I wear this one really chunky ring, especially when I know I’m going to have a stressful day or when I’m heading into an important meeting. I twiddle the ring around my finger and its strangely satisfying. There’s something quite poetic about the image of an architect twiddling a house around their finger. Do you have anything like my somewhat nervous tick, something that I most likely acquired during grad school? LB: Yes I do! It developed for me when I bought a kinetic ring by Michael Berger about 10 years ago. Through gravity, it has this beautiful shift in weight, which made twisting it around my finger incredibly therapeutic and also strangely enjoyable. What I love is that everyday objects are able to create new habitual routines or behavioral twitches, and in doing so it creates opportunity for new complexities and distractions. As I twist the Concrete House Ring my eyes and other senses are naturally drawn to my hand, allowing a new focus as I retreat into the world of my own making. AG: Can you describe the fabrication process? LB: The ring is essentially two parts: hand casted composite concrete between a silver inner and outer enclosure. I developed a system of rods with a jewelry designer to hold the pieces together while forming an encasement for casting the concrete. Internal rods tie the concrete to the silver pieces in a similar manner to the working of post-tensioned concrete in building design. I also played around with the casting component. Concrete, alone, was too brittle and porous to create a durable and long lasting ring. I needed to find a way to strengthen the material. After speaking with a concrete manufacturer, I mixed concrete with an epoxy resin and tested over 40 ratios of resin, concrete and colour pigments to get the current ratio, which is stable, durable, and strong. Throughout the design process I spoke with builders, concrete suppliers, and material manufacturers. AG: Have you always been interested in jewelry design? How did the idea first come about? LB: The ring was such an introverted and personal expression that I didn’t look towards other designers nor make reference to any existing jewelry pieces. I don’t wear much jewelry but have always had a soft spot for larger rings that I can play with on my finger, part object and part plaything. I tested different techniques of laser cutting, hand-casting, and 3D printing. I wanted to hand cast the ring because this process is more intimate than others, while also allowing for imperfection and each casting a unique quality. I also played around with glass, plastics, timber, steel, silver and concrete. I have always loved concrete; it feels brutal and raw and provides unique patterns of air bubbles and cement formations with each casting. Concrete also wears beautifully over time, developing small chips and cracks, creating scars telling of its use and misuse. 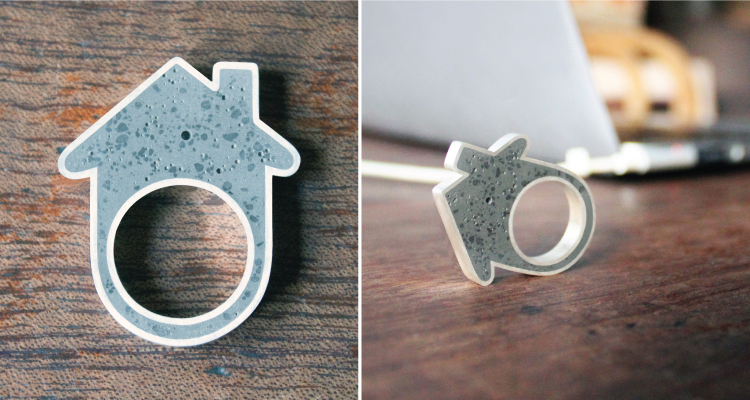 Would you like to purchase your own Concrete House Ring? I am currently working through the logistics and details of producing more high quality and unique Concrete House Rings, allowing the original narrative to take on new significance and meaning peculiar to each owner. Please enter your email below so I can notify you when your ring is ready for purchase. “Museum Für Angewandte Kunst Köln: From Aalto to Zumthor Furniture by Architects.”SMOW. N.p., 15 Jan. 2012. Web. 21 June 2013. http://blog.smow.com/2012/01/museum-fur-angewandte-kunst-koln-from-aalto-to-zumthor-furniture-by-architects/. this is amazing! you are the coolest. This ring has a very personal feeling.It’s audacious.Thanks for sharing.